If you’re a woodworker, your router is an essential piece of equipment. 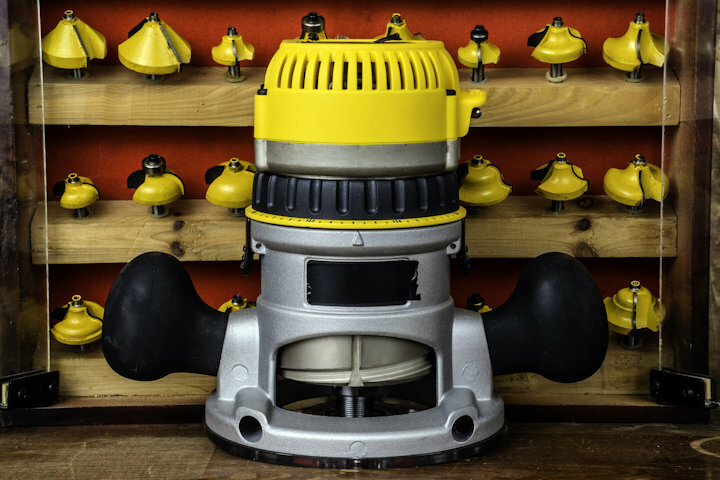 For woodworkers just starting out, the idea of spending hundreds or thousands of dollars on one tool can be a daunting idea. For seasoned crafters, it might be time to upgrade, but you don’t know what to do with the old router. A solution for both? Selling the used router and bits. Since this is a tool you most likely want to see in person before you purchase it (and if possible, try it out before plopping down the cash) start locally. Check your local newspaper’s classified section for tools for sale. Local online ads, as well as regional papers, are also a great place to search. If you need to expand your search, Amazon.com and eBay are also options. Ads with photos are best since you can at least see the tool being sold. If you want to check prices, you can search for the router’s make and model number in Google or refer to a used price guide to find out if the requested price is fair. If the pictures are good and the price is right, contact the seller and negotiate the sale. You can use this same approach for bits that are being sold separately, though most people throw in the bits or include them in the price. The first thing you want to ensure is that the router works, and the bits are in good condition. Clean the router and bits so everything looks more presentable. Then take several photos of the tool and included pieces. If you are selling bits, a separate picture of those is a good idea so interested customers can see exactly what they’re getting for your sale price. You should include both far away and close-up photos of the router, so customers get a clear view of it. Once you have several decent photos, you need an ad. It doesn’t have to be a masterpiece, but it should answer all the pertinent questions: The make and model of the router, it’s condition, the selling price and what’s included. You can add additional information regarding why you’re selling it, if it was a good tool, etc. But so long as you answer the primary questions and provide payment and contact information, that should be sufficient. When pricing, you can price the router and bits separately, but if the bits are proprietary to the router, add the bits to the price of the router. Or just throw them in. Unless you have another router that can use the bits – they’re not worth much by themselves. You can sell the router and bits on a variety of websites including eBay, Amazon or Craigslist. But you might want to start with your local paper and online ad sites. A router is something a buyer will have to pick up or you’ll have to deliver, so it would be easier to sell and deliver if it’s a local buyer. Place flyers on bulletin boards around town with your phone number so interested people can call you. If you don’t find a local buyer, you can branch out to other sites. By selling an old router and bits, you can help finance new routers and new bits, not to mention make space for the new tool. For the buyer, the router could mean the start of a new hobby or small business. Whether you’re the buyer or seller, a successful sale should be a win for both parties. Here’s an alternative way to use your routers. Since setting up routers is time consuming and frustrating, I try to keep several around the shop. Think about it, when you need to set up a router, you’ve got to find the proper wrench/s, the right bit, then while your router is flopping around on the bench you’ve got to remove the old bit, which is usually stuck, insert the new one and then do trial and error cuts until you get the bit setup to cut “just right”. When I say flopping around the bench I mean this. Many (maybe most) routers will not sit on their heads for easy bit access. Since you can’t set them on their bases and access the Collette nut/s with reasonable ease, you lay them on their sides. The router base is in the way and often needs to be removed, the cord is in the way, and the router housing is round so it rolls around (or flops around) as you try to loosen and tighten the Collette nut/s. At best, this is an awkward setup. I keep several routers in my one man shop, each one setup with a different, and frequently used, router bit. All I have to do is grab the one I want and go right to cutting. I keep the costs down by buying used routers on eBay. I don’t buy expensive routers, especially for use with the smaller router bits. Yes, sometimes the routers end up being duds but this doesn’t happen often (I’ve only discarded one) and if one breaks, I throw it away as it’s too expensive to buy repair parts unless it brushes. Often the shipping cost exceeds the purchase price so this is not an expensive project. I won’t tell you how many routers I have but it’s over ten. I do have a couple of more expensive routers for those big jobs. It all works great for me and keeps the cuss word count to a minimum. You forgot one critical guideline. Be realistic/fair with the pricing whether selling, buying, or even trading. Don’t waste other people’s time, nor yours. Don’t price a used item for $150 when it’s worth $80, and a brand new one costs $160. You can, but you can consider yourself lucky if you get a sale, find a sucker, or someone in desperate need. Otherwise you’ll be the one to blame when you’re stuck with it, and can’t buy beer. Craig’s List. Craig’s List. Craig’s List. It’s the best place for buying and selling all sorts of stuff. I’ve picked up some amazing stuff, for FREE, in the “Free” listings, including a perfect and fully functional O’Keefe and Merritt gas stove, various furniture items, fire wood and chickens. All for FREE. But I’ve also picked up huge deals on other items including camera gear, tools, etc. Forget classified ads in newspapers. That’s so 1980’s. Craig’s List is free to use, you can upload numerous photos and not have to pay a penny and include whatever contact information you want. Best of all, you don’t have to put your phone number or personal email out there for the world to abuse and hack. When you list something on Craig’s List, you’re given a unique Craig’s List email address that only links to your personal email and isn’t traceable. When you’ve finished selling whatever it is you’re selling, the Craig’s List email address goes away (as does your listing when you take it down after selling your item(s)). It’s a great system and it’s no wonder it pretty much single-handedly killed print newspapers in the ’90s. I used to be a newspaper guy and a paper’s bread and butter was classified ads. They charged by the inch and by the number of days your ad ran and photos cost an arm and a leg. Craig’s list leaves your ad up for weeks until you take it down, you can write hundreds of words talking about what it is you’re selling and you can upload dozens of photos… for FREE. Save yourself the headache and ignore the advice about checking local papers and classifieds. Craig’s List is the bomb!